The Hammerli 208 is a descendant of the Walther Olympia. 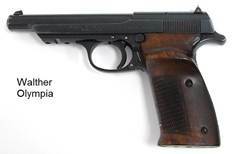 In the period immediately after WWII, when Walther was forbidden to manufacture firearms the Olympia was produced under license by Hammerli. Apart from the rear sight mounting and the grip angle, the lineage from the Walther Olympia to the Hammerli 208 is obvious. The 215 is in effect the 208 without the polished exterior finish of the 208; the 215 has a blued, sandblasted finish. § Slide the follower down the magazine body to the point where the cross-pin lines up with the circular relief in the right-side slot. One of the things I noticed is that the trigger was just over 3 lbs, around 3.25. Since I plan on using this for Bullseye and ISSF matches, I'd like to get it down to 2.2lbs. Looking at the instructions on Pilkguns I tried to adjust the screw in the trigger, but that seemed to have no real impact on trigger weight. I know they made several types of triggers for the 208, and I also see that mine has a screw on the left side of the frame above the trigger (see the screw w/red dot in pic). Does that have an impact on trigger weight, or is there something else I should be looking at? Any info would be great, thanks! The side screw really is just a coarse adjustment for the trigger pull weight, which can be used as a quick change device if desired (and was the reason it was added). The "correct" position is with the red dot on the screw aligned with the dot on the frame. However, it also needs to be at the current number of turns to be at the right weight, and the screw on the trigger needs to be correct. The best option might be to turn it one complete turn at a time (with red dots aligned at the end) until the trigger pull is in the desired range, and then use the screw on the trigger as the fine adjustment. It is hard to tell from the picture if the matching dot on the screw is there or gone. If gone, just use the groove on the screw as the guide or alignment mark. When making changes, don't forget which direction you are turning it, and how many turns. That way, if you've gone in the wrong directly, you can at least return to where you are now. With a trigger pull at about 1500 grams+, it sounds like it either has been rotated the 1360 gram setting and then another turn (if the red dots are aligned .... 1360 grams is 3.0 lbs), or there is another problem with the trigger. The high trigger pull may also be due to insufficient or improper lubrication, and not due to a problem with the adjuster. During the Dixie Matches held in Florida in March 2000, Mr. Larry Carter of Larry’s Guns spent some time with the Air Force National Pistol Team members discussing the care and cleaning of the Hammerli 208s. He described both basic and detailed cleaning and maintenance as well as adjustments to the trigger. The detailed cleaning/care involves punching out pins and disassembling the internal parts. This should not be done solely from notes, and is only necessary on a semi-annual or annual basis, depending on how much shooting is done. Therefore, detailed notes will not be covered in this document. a. One specially formed brass brush. This brush is used to clean the chamber. It is made by bending a .25 caliber bore brush at a right angle so that the tip length matches the length of an empty .22 case. b. One M16 style cleaning brush (toothbrush style with smaller brush at end of handle). c. Cotton swabs to use for cleaning and for lubrication. e. Cleaning cloth. A mechanic's cloth is recommended. f. Nylon cord such as weed-eater line or similar. This will be used to PULL cleaning patches through the bore. Prepare one end of the cord by melting it so that it clears the bore but will hold on to patches. Form the other end into a point that will easily pierce the .22 caliber patches. h. Molybdenum (Moly) grease which does NOT contain graphite. a. Disassemble the pistol far enough to remove the slide (see Field Stripping the 208:). c. Remove the trigger bar spring and the bar itself. Note that the spring is supposed to be bent to the side. Do NOT attempt to straighten it. Additionally, the curve should be circular. If the spring is flat or the curved area has a flat section on top, replace the spring. d. If there is a buildup of debris under the ejector, carefully remove the recoil spring by pushing in on the end with a small flat blade screwdriver and turning so that the post clears the slot in the frame. Do NOT point the spring toward your face as you remove it, as it is under pressure and could easily fly out of the frame. After the spring is removed, lift the ejector out of the frame. e. Clean the frame using the M16 style brush. Be VERY careful not to dislodge or bend the slide stop spring. Use a cloth around the brush for the magazine well. LEAVE the hammer area alone. It should not need cleaning. f. Clean chamber using cotton swabs first. Next use the specially formed .25 caliber brass brush by inserting it into the chamber and twisting back and forth several times. g. Place a patch on the nylon cord and pull it through the bore threading the cord from the chamber though to the muzzle. A patch should be sufficient, however if a brush must be used, do the following: Place the empty rod carefully through the bore from muzzle to chamber first. Next screw the brush onto the rod. Finally, PULL the brush through the bore from chamber to muzzle. Repeat patch procedure. NEVER push a brush through the barrel in either direction. h. If the crown needs cleaning, use the cloth only. Note that if the dirt pattern is clearly visible, it should show close to perfect symmetry. i. Clean the ejector and recoil spring assembly. j. Place the ejector into the frame and the spring assembly into its slot. When setting the spring, start with the post pointing toward the barrel, push to just before the slot, turn the post to engage the slot and lock it into place. Note: Wear marks will be visible on the spring. When the wear approaches one-quarter of the diameter of the wire, replace the spring. k. Dampen a cotton swab with CLP. Paint a light film of oil under the area where the trigger bar will rest. l. Place a small amount of Moly lube on three places on the trigger bar: the hole which engages the trigger; the post which contacts the slide; and the hook which engages the sear. m. Place trigger bar in frame and then put spring in place with the ends pointing toward the muzzle. Ensure that the spring is in the slot on the trigger bar, not under the bar. n. Using an oil-dampened swab, lightly swipe sides of frame and center inside of slide where hammer rides. o. Place grips on frame. p. Place slide on frame. q. Place rear sight on frame. 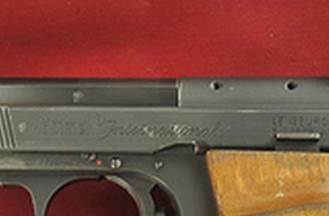 Mr. Carter said that the rear sight should always be placed back on the pistol to prevent the slide from dragging across the hand while firing. Note that NO chemicals were used for any portion of the cleaning and that only a very light application of oil was used. Do NOT over-oil. a. Initial Slack - The pistol has to have a small amount of initial slack to ensure re-engagement of the disconnector with the sear. To check this slack, with the grips removed, observe the contact point between the disconnector and the sear. Using the screw on the front of the trigger assembly, adjust to obtain a slight movement between the disconnector and the sear when the trigger is moved. b. Trigger Stop - The trigger must have a slight movement between sear hammer disengagement and the stop. This will prevent the sear from riding on the hammer surface while the hammer falls. If this adjustment is too close, the sear will wear and need to be replaced. To adjust this, turn the allen screw in the frame ahead of the trigger assembly to ensure that the sear does not drag on the hammer as the hammer is rotated through its arc. c. First Stage Weight - Use the screw behind the trigger to adjust the first stage weight. d. Trigger Length - The positioning of the trigger will affect the weight and the length of pull. Therefore, adjust the placement before setting the trigger pull. Do NOT over-tighten the locking screw! Minimal force is needed. e. Second Stage Adjustment - There are two concentric screws to adjust the second stage. The outer screw will adjust roll; in will increase roll and out will decrease roll. Do NOT back completely out. If backed out too far loss of second stage and damage to the sear will result. If the outer screw is to be adjusted, first turn the inner allen screw inward, out of the way. After the outer screw is adjusted, the inner one can be used to set the weight; normally at two pounds. o I first noticed this when I had disassembled my magazines for refinishing – the ‘chatter marks’ coincide with the position of the cross-pin when the magazine has 1, 2, 3 or 4 rounds remaining in the magazine. o This condition is not peculiar to the Hammerli 208; my (very much used) GSP-H shows the same type of ‘wear’ pattern on the magazines, and is probably typical of most semi-automatics after many thousands of rounds. o The judicious use of a small sharpening stone will remove any raised edge from the chatter marks. · a suitably-sized small ball bearing ball will replace #1 203 110: however, the pin from a short car tyre valve cut to an overall length of xxxx mm can be shaped to a near-point and used as detent. · Over-adjustment (i.e. up) of the sight elevation. 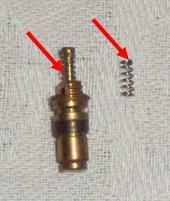 There are only about 5 complete turns from base of the elevation screw before it comes out of the screw base: being spring-loaded, the sight leaf then jumps up and the adjusting screw ‘pops out’ – with no retention, the detent ball and spring then pop out of the adjusting screw (usually, never to be seen again). If you are working at the top of the adjustment range of the sight (i.e. more than 4½ complete turns from base) to achieve your desired area aim, a lower front sight is advised.